If you have come looking for help using tvCADdesktop then you have come to the right place. This page is an interim quick get-started for the beta testers on my mailing list. If you want to use tvCAD before it is released in April 2017 then please join my list at the bottom of http://www.tvcad.tv/. Windows 7, 8.1, 10, all 64-bit. I have not built a 32-bit version at this stage. Perhaps, if there is demand. Windows XP is past its end-of-life so – NO. Windows Vista might work but I haven’t tried it for many years. tvCAD has rarely used more than a few hundred MB of RAM in general usage (usually less than 200MB), although a cable schedule with ~ 100,000 cables used ~ 800MB momentarily while it was creating the spreadsheet. tvCAD will run at the pretty-much the same speed as everything else on your computer. The installation is around 200MB, depending on which part of Windows you ask. 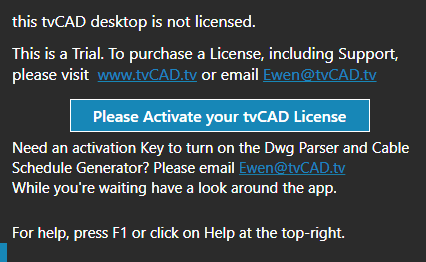 You don’t need AutoCAD, it is built into tvCAD. The AutoCAD part is 90% of the size of tvCAD. It’s AutoCAD 2017 so tvCAD can ready any drawing you can read in the latest version of AutoCAD. You don’t need SQL-anything, the database engine is built into tvCAD. You don’t need a DBA, there are no database administration tasks, it just works. tvCAD runs on the .NET 4.5 framework. The installer will let you know if it is missing. Before you can parse any drawings or generate any cable schedules you need to activate your license, (yes, even for a Trial). The activation and information about your license is on the “about” page – click “about” at the top-right. You need a license key, so please send me an email and I will send you your Key asap. The easiest way to email me is to click on the email link on the “about” page in tvCAD. Your trial license unlocks all the functionality for the duration of your trial, everything works exactly the same as the version you buy. If your trial time not long enough just let me know and we’ll work it out, no worries – we’re all busy here. 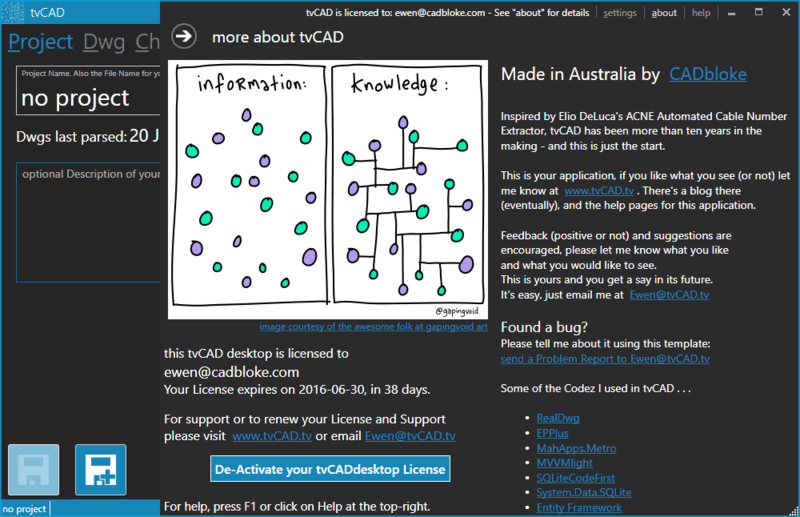 While you are waiting for your return email, everything else in tvCAD still works so you can have a look around it. Here is the Settings page with all of the settings turned off and on to show what they do. The text is clearer in the App, they have been resized for this page. Click on them to see the originals (same for any image on this page). tvCAD organises your things into discrete projects. 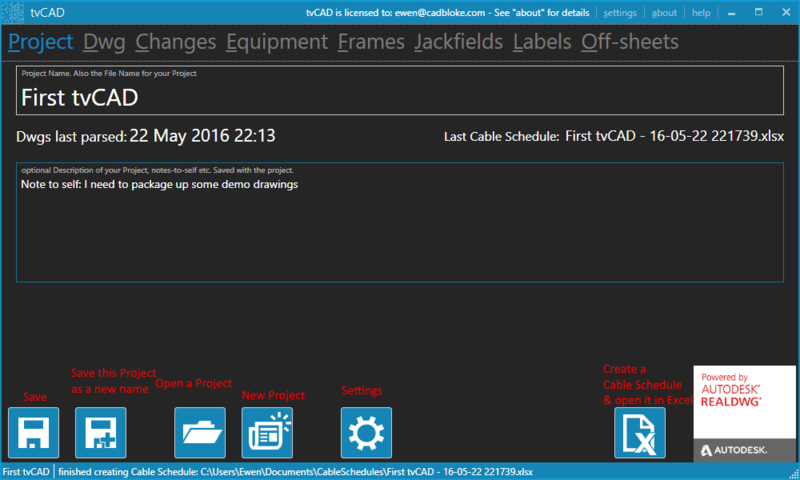 A project can have any number of drawings but produces only one cable schedule at a time. They may be long-lived for big projects or short-lived just to keep an eye on a drawing you are working on. A tvCAD project will have a companion tvCAD database with the same name. Go through the settings and choose some sensible defaults to save as the basis for all new projects. All of the settings are per-project and you can change your default settings for new projects at any time. Have a look through the rest of the settings and compare the on/off settings of each. At least a few of the other settings are probably not particularly intuitive so I will update this page with explanations of them as soon as I can. Please ask if/when anything confuses you. Anyone who has used ACNE will recognise quite a few of these settings. Don’t panic about all the Regular Expressions in the settings – I don’t expect you to learn how to do those, part of your support is to get me to work those things out for you. Most of them are set and forget, they won’t change much, if at all, between projects – they are more like policy decisions than anything especially specific to a drawing. If you have settings you would like to keep as the default for new projects then click on the big blue button at the bottom. You can load a project with settings you want to persist and save those as your default at any time. Name your project on the “Project” page. This will also be the name of the tvCAD database and the Cable schedules. Did you notice the settings near the top about the cable schedule “Time Stamp”? The default is “Project Name 16-05-22 123456.xlsx” which is the date reversed so it’s yy-mm-dd then followed by the time of the cable schedule in hhmmss so the previous example was produced at 12:34:56. You can change that if you like. you can sort and filter columns the same way that Excel works. Hold the control key to sort by more than one column. you can group drawings by things like folders by dragging the top of the Folder column up into the area with 3 dots on the right. 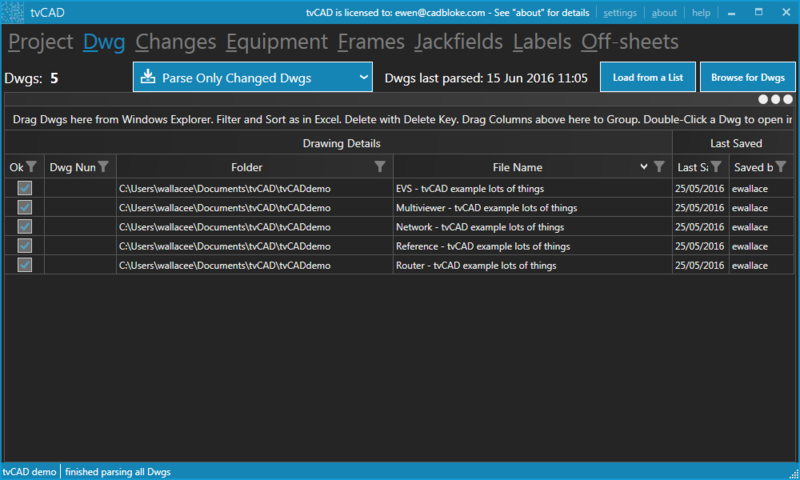 If you move, rename, delete a file in real-life then tvCAD will prompt you to find it or delete it from the list when it goes looking for it. 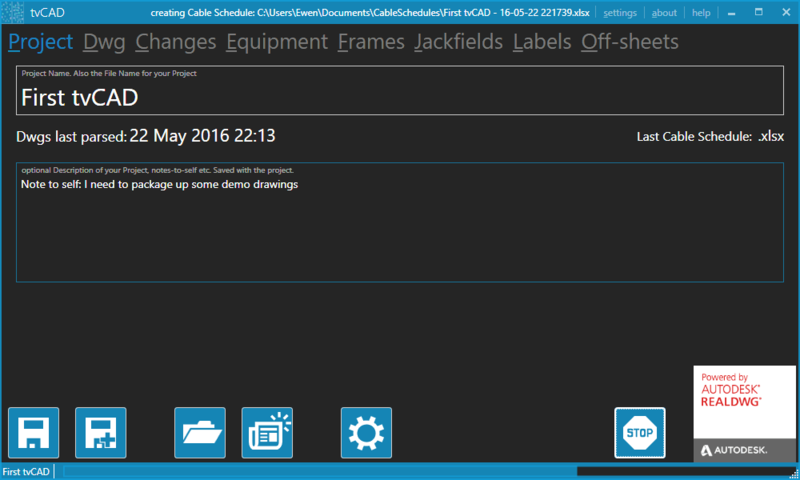 If you drag a drawing into the list that was already in the list then tvCAD knows that and it will not duplicate it. The (big) button for parsing drawings has options to parse all the drawings, just the ones that changed since last time ,or just the ones you have selected in the list, or just check to see which ones have changed without parsing them. The same button also turns into a cancel button if you want to stop the process. I promise I will find a better screen-grab tool. You can stop parsing and cable schedules with the same button. There is a progress bar at the bottom of the window (same as for the drawing-parsing pic above). When a process finishes the progress bar goes away and a message tells you the last thing that happened. The current event is at the top. Once you have your project set up, your usual tvCAD workflow is thus: one click on the big Excel button when you want to parse all the drawings that you have changed, create a new cable schedule and open it in Excel. Yeah, one click. Here are a few drawings, a cable schedule and a tvCAD project. Have a look, try them out in tvCAD and see how it works for yourself. How? please join my list at the bottom of http://www.tvcad.tv/ to get the preview beta. There is more to it than this and I will be expanding on this a lot in the near future. Please, if you have any questions send me an email, tweet, whatever you like.